We act in ways that are ethically sound and represent the highest ethical standards. We earn the trust of others through our actions. We work with those inside and outside of our Company to achieve our objectives. We take responsibility and ownership of our role on the team. We are accountable to others for our performance as a team member. We look out for the safety of our peers and for those in the communities in which we operate. We consistently demonstrate respect for each other, the environment and our communities. We treat each other fairly and respectfully; in ways in which we like to be treated. 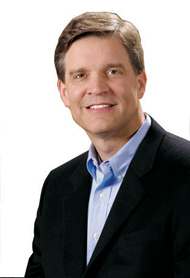 We recognize the importance of family in the lives of our employees. We value and benefit from individual and cultural diversity. We passionately strive to do our best in all aspects of our work and our lives. We continuously improve; learning from our successes and failures. We put all of our heart, mind and strength into our work. We pursue our objectives with a priority on the health and safety of our employees and business partners. We develop creative ideas that have the potential to change our world. We encourage creativity and discovery of improvements. We foster a learning culture. We search for ways to work more safely and to minimize our environmental footprint. Our actions define us as people; and our people define us as a company. Our Code of Conduct and Ethics (“Code”), together with all Company policies, serves as our guide to “Doing Right” and operating in accordance with our core values. Our Code applies to everyone who works for Denbury—every day, in every location. This includes all Denbury directors, officers, employees and contractors. We are all expected to know and follow all laws, regulations and Company policies that apply to the work we do. Annually, everyone affiliated with Denbury is required to certify their compliance with the Code and disclose any potential violations. In order for our Code of Conduct and Ethics to better align with management’s commitment to ethics and compliance, in 2013 and 2014, a team consisting of members of the Internal Audit and Legal departments collaborated to design a refreshed Code. The result of this collaboration is a values-based document organized around Denbury’s five core values: Integrity, Teamwork, Innovation, Excellence and Respect. 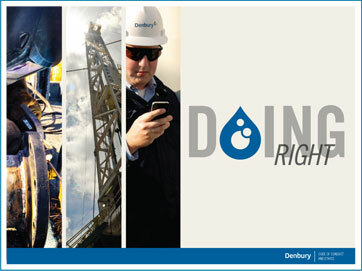 Our refreshed Code exemplifies Denbury’s commitment to “Doing Right” in the conduct of its business. The refreshed Code is organized and written in a way that better promotes employee comprehension. The Code contains numerous “What Should I Do?” and “Conduct Tip” aids, which provide guidance to employees on common risk topics. This theme was carried forward to Denbury’s Compliance Hotline via a personalized URL (DoingRight.Denbury.com) and phone number (1-844-DOING-RT).